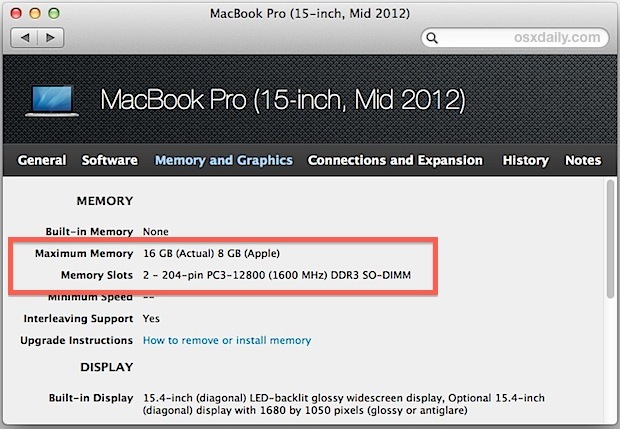 Different Mac models use different types of RAM, and each also supports a different maximum level of RAM. Unless you spend a lot of time upgrading and repairing Macs yourself, you probably don’t know these exact details off the top of your head, and that’s just fine because the information can be retrieved directly from the Mac in most cases. This is vital information to know if you have determined a memory upgrade is in order, so we’ll cover several different ways to find out what RAM type and speed a given Mac uses, what the maximum amount of supported RAM is, and if RAM slots are available. The quickest way to find out RAM details of a Mac is to check About This Mac, which will identify the memory module type and speed, how many RAM slots there are on the Mac, and which slots are in use. If for some reason you can’t boot the Mac, or if it’s older and doesn’t have memory details in System Information, you can use other options to find the RAM type, speed, and maximum capacity as well. 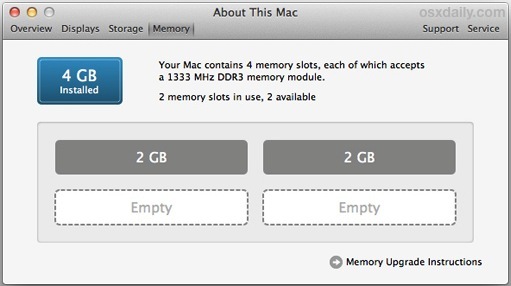 Though MacTracker contains an abundance of information, we’re using it specifically for Memory information, so locate your Mac through the list or search, then choose the Memory tab to see details about the Macs RAM capacity, type, and if it’s user serviceable (i.e. : upgradable) or not. The iOS version is an excellent companion app for more technical Mac users who like to perform hardware upgrades on their own, but both desktop and mobile versions contain the same treasure trove of information about hardware. This is one of those apps that is so freakishly useful that every technically-minded Mac or Apple hardware owner should have it installed. Apple’s web support is easy enough to use, and because it’s available on the web it’s accessible from just about any device. So if your MacBook Pro has bad memory chips and won’t power on, and you only have an Android phone or a Windows PC available to you, you can still use Apple’s support site to get the important details. Finally, you can always get the exact RAM type, capacity, and maximum from the myriad of memory sellers out there. Crucial has the Mac Memory Advisor tool which is extremely easy to use, and you can always just search Amazon for Mac RAM with a model name to find the RAM upgrade kits available to that specific hardware, the largest kit of which is the maximum supported amount. If you are upgrading RAM on your own, don’t forget to run a memory test on the new modules to be sure that everything is in full working order. Though RAM is checked at the factory before shipping out, every once in a while a bad chip does get through the quality assurance process and ends up in the hands of a user. Frustratingly, sometimes that bad memory will actually work just fine… to an extent at least… and only cause weird issues and crashes. But that’s exactly why the aforementioned RAM test is important, it can help you weed out such a problem before it causes any annoyances.